Green is the color of the world. Soothing and tranquil, green conjures up images of peaceful woods and quiet meadows. Grass is green - but not always. You can use substantial clumps of ornamental grasses instead of shrubs in your landscape. They can also hold down a steep bank, stopping erosion. They aren’t the grasses of manicured lawns but rather of the American prairies and African savannahs, tough and tolerant of a wide range of conditions. The often-used ornamental grass of choice here in the midlands of South Carolina is pampas grass. There is a reason for its popularity. It is readily available and extremely easy to grow. Dig a hole, plop it in, let it mature; cut it back in late winter before it starts to grow again. The plumes can be spectacular. Or not. Pampas grass is dioecious, meaning the sexes are separate. It grows up as either a male or a female plant. The female puts on the show with big, fluffy ornamental seed heads. The male’s blooms are slim and stringy. Nevertheless, they both command attention in the landscape. If matching plants are wanted, divide a clump. Seedlings vary widely in their size, shape, and bloom appearance. Siting is also important. They take up a huge amount of space. Their leaves are saw-toothed and sharp. Keep Pampas grass away from sidewalks and entries. Many ornamental grasses available are easy to grow, require little water, and fill an important role in the landscape. Some have foliage that mounds. Some stand stiffly upright. The leaves can be soft and shimmery or thick and razor edged. The plumes, the grass flower, can be white, pink, red, beige, or cream and be fat or thin. Leaf colors, too, range from deep to pale green, lime green, blue, pink, red, silver, and almost white. Most ornamental grasses share a need: sunlight and good drainage. Many will tolerate some shade, but they tend to flop over or lay down if sunshine does not reach them for most of the day. You can use them in dry areas or alongside ponds. As with all of nature, there are exceptions. Some thrive in the shade. Some will even grow with their roots wet. 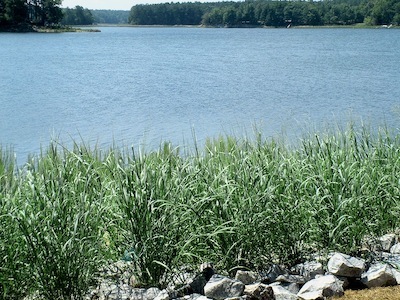 The photograph shows switch grass, an attractive native grass with bluish leaves, being used in lakeside rip rap for erosion control. It stands upright in bunches and grows to about three feet tall. It will grow in full sun to part shade and will tolerate wet roots. Its roots go down four to six feet, making it a good choice to hold a hillside or pond rim. ‘Heavy Metal’ is an appealing blue leaved cultivar for the home landscape. Fountain grass mounds and shoots sprays of flowers in every direction. It soaks up full sun and some water when dry. Fountain grass will grow in wet areas, too. Many cultivars are available. ‘Little Bunny’ is a cute little dwarf with chubby seed heads. Some of the fountain grasses on the market are annuals. You would have to plant annual varieties every year. If you want a permanent planting, make sure you purchase a perennial plant. Zebra grass and porcupine grass are very similar in appearance. They both have yellow bands of zebra stripes on the blades. Zebra grass is a flopper and often needs support whereas the porcupine grass, ‘Strictus’, is spiky and stands tall on its own. Both grow in clumps and are large plants, five to six feet tall - taller in bloom - and almost as wide. Do not be concerned if your zebra grass sprouts solid green leaves in the spring. This is normal. It gets its distinctive stripes as the season progresses. ‘Morning Light’ is a smaller version of the common Eulalia grass. It has very thin green leaves with white stripes on the margins. Use it in sun where you need a 4 feet tall specimen. The variegated Eulalia grass has wide bands of white. From a distance, the leaves look very white. Northern sea oats, which is also called Upland sea oats, can be sited just about anywhere in the garden. It will tolerate wet feet or dry, sun or shade. A caveat: This grass will take over a mulched bed. It self-seeds rampantly, even coming up between bricks in a pathway. It is a native grass which misbehaves in a structured garden. If you do not want it everywhere, cut the flower stalks and use them in floral arrangements. The wide green foliage stays attractive the whole season and dies back in winter. There is another grass, beautiful in form and color, which loves moist shade. Japanese forest grass, Hakonechloa, takes several years to become established. It combines beautifully with hostas and ferns. The shimmering golden variegated ‘Aureola’ slowly reaches one to two feet in height. Grow this one strictly for its beautiful broad satin ribbon foliage of cream, chartreuse, and green. Some of the underused grass-like plants are the sedges. They are tough plants. You can use them in wet or dry conditions. They form mounding fountains, are low growing, and are suitable for spilling over container edges. 'Toffee Twist' Sedge is an unusual wig like beige-blonde color with very narrow leaves. ‘Bowles Golden’ sedge has wide chartreuse green leaves and grows in a flower border or in shallow water. Variegated Japanese sedge has a wide white middle stripe. The soft and swaying grasses add a big dose of grace and drama to the landscape. The stiffly upright forms add structure. All require very little care. Although the bloom stalks are attractive and are often left in the landscape until spring, many of the grasses can be an environmental problem if they escape the garden. Grow responsibly. Remove these seed heads before they ripen and use them indoors in dried arrangements. Most ornamental grasses are low maintenance. They seldom suffer serious diseases and are rarely bothered by insects. Since most grasses will increase their girth and become as wide as they are tall, check to see how tall they will grow. Use the height measurement as a horizontal guide to determine how much room they need. When planting, make sure the crown of the plant remains above ground. Remove the seed heads before they ripen. Leave the foliage; it helps protect the crown throughout the winter. Cut it back to four to six inches in late winter, before the new growth begins. Lightly fertilize around the perimeter of the plant in spring. Wash any fertilizer off the crown and leaves immediately. Keep well watered the first year to get it established.